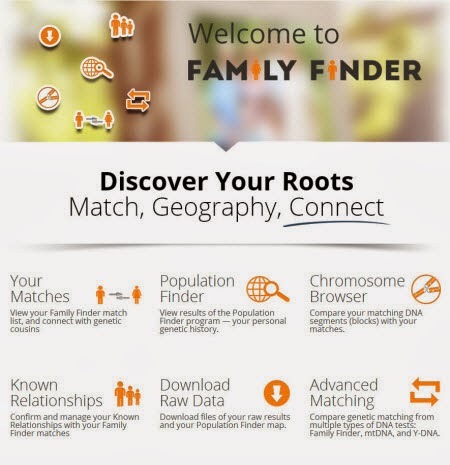 Family Tree DNA has done a major redesign of their website. As always, some will prefer the old way, but so far I love most of the changes. And I am so glad they waited until after I did my workshop Saturday so I didn't have to madly update screenshots at the last minute. This "how to" list was quickly put together to help some friends who asked about the changes. I lost access to the website before I got the final screenshots I planned to use. That also means I was unable to go back and confirm I covered all the steps correctly. So there may be updates to this post tomorrow after I get to double check the steps. 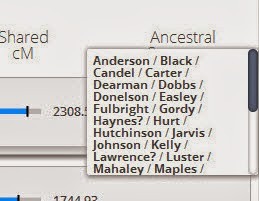 Once you login your home page (my.familytreedna.com) looks similar to the way it used to, but once you click on Family Finder you'll see the changes. To my eye this is a new and modern look that I like. Click on Your Matches and then you'll see a newly organized match list with some options in new places. For some time now the first list of matches displayed has been only your "Close and Immediate" matches and this is still true. But the format of the displayed data is new. 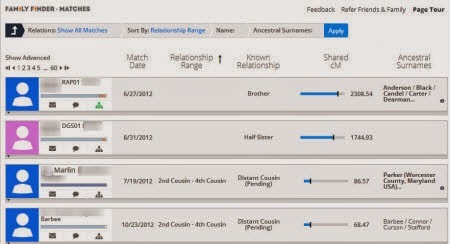 Click on the words "Close and Immediate" in the Relations field to get the drop down list to change to "Show All Matches." Be sure to click "Apply" at the right side of the bar to apply the change. Click on the words "Relationship Range" in the Sort By field to get the drop down list to change the sort algorithm used, if desired. All matches now are displayed, but you don't see the longest block shared in this first view. Best of all, now the ancestral surname list is limited in screen size. It can be scrolled to see all of the names by clicking the "i" icon to the right of the names. Now it doesn't take up a whole screen for one match who has entered dozens and dozens of ancestral surnames causing all of your other matches to scroll off the screen, but you can easily see all names entered. Click on "Show Advanced" just above the name of the first match displayed. 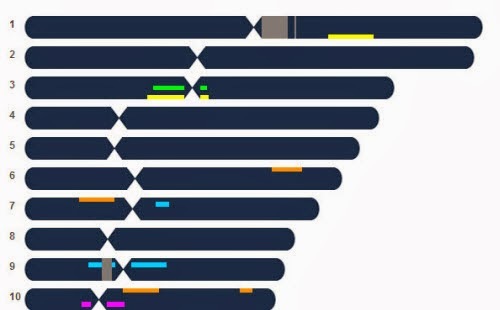 Now you'll see an additional line of information for each match: Triangulate, Tests Taken, Compare in Chromosome Browser, Longest Block, and, if available, haplogroups for Y-DNA and mtDNA. Triangulate allows a choice of "In Common With" or "Not In Common With." Clicking on "Compare in Chromosome Browser" allows selection of up to five matches from this page. A box at the top of the page will collect the names and allow you to remove and add names as needed. Then you can jump right to the chromosome browser and it will be populated with the choices. I'd advise you to wait before logging in to try these new features. It looks like the Family Tree DNA website may be overwhelmed right now unless something else locked up my browser window to the site. But play with the changes and give it a chance. I think there is more to like than dislike with what I have seen so far. 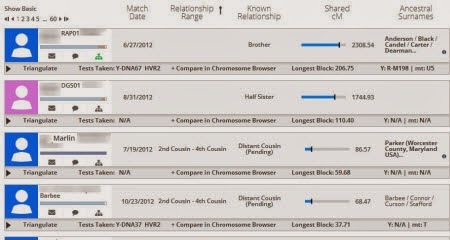 Debbie Parker Wayne, "Family Tree DNA Website Update 10-2013," Deb's Delvings Blog, posted 2 October 2013 (http://debsdelvings.blogspot.com/ : accessed [date]).